THE DOCTOR would appear to have a new set of enemies. Like the Cybermen, they appear once to have been humans, but they now seem to have purged emotion, humour, and indeed humanity, from their make-up. Like the Autons they are faceless dummies whose Achilles' heel is an inability to hit the right target And like the Sontarans they're caught in a time-warp which leads them to lash out in the wrong direction. The Doctor's new enemies are, of course, the Censors. Inhabitants of a strange parallel universe known only as the British Board of Film Classification, the Censors suffer from tragic myopia but wield immense power. They have ruled that the latest series of Doctor Who cannot be shown to children under 12, when it comes out on DVD, because of the programme's "excessive cruelty". The Censors specifically object to a scene broadcast last month in which the Doctor subjects an imprisoned Dalek to a bit of rough-house treatment Taking a tough line with a species bent on mass murder and world annihilation is clearly too much for the Censors, who are worried that the Time Lord's behaviour may set an unhappy precedent In the words of one of the Censors, "however cross one might be with a Dalek, being cruel is not the way to deal with the issue. Some children might take it into the playground." It's good to know that the BBFC are concerned that any Daleks who find their way through space and time into the nation's playgrounds should not be unmercifully bullied. But leaving aside the important issue of just how the nation's children should react to the arrival of a Dalek during lunch-break (make sure it doesn't feel excluded by picking it first for the football team?) another ticklish question of space travel arises. Just what planet are these Censors on? The BBFC professes itself "concerned at the use of violence to resolve problems" in a programme that children might see. Where have they been while the rest of us were growing up? Conflict is integral to drama, and those who construct narratives to grip young minds have always known that J. R. R. Tolkien and J. K. Rowling place their heroes on fields of battle under darkened skies where good and evil contest for mastery. Children, as the tale of the emperor's new clothes is there to remind us, have an unerring ability to spot the bogus, pious and inauthentic. A picture of the world around them purged of conflict will not engage their minds because such a depiction does not engage with the world in which they are growing up. To imagine that our children can be turned into a nation of Fotherington-Thomases, tripping through the daisies and greeting the sky, is to indulge in a fantasy further removed from reality than any Doctor Who script. It would be easy to dismiss the Censors' judgment on Doctor Who as just another piece of bureaucratic foolishness from a body that has taken political correctness too far. But it is worth noting precisely because there are all too many examples in our society of just such a phenomenon. What is really remarkable about the BBFC's judgment is not how singular it is, but how typical of a prevailing attitude. The Censors' action over Doctor Who crystallises, in all its absurdity, key trends of our time. First, the judgment of a bureaucratic elite is held to be superior to that of informed individuals, so government appointees, not parents, decree what is the correct way to bring up children. Secondly, art, including drama, is forced to conform to external criteria of "worthiness". Works that should be there primarily to entertain have to serve a socially useful function. Soaps have to communicate the right message on drugs or dating, children's drama has to promote an ideologically approved means of resolving disputes. Thirdly, children themselves have to be brought up in an environment purged of danger, conflict, risk or jagged edges. There's not much risk of them torturing any stray Daleks in our playgrounds when they're not even allowed conkers. And while absurd restrictions are put in place to protect their bodies, so now censorship is deployed to protect their minds. Commentators on the Right are sometimes accused of over-reacting to the march of political correctness by jumping at every provocation. Why get worked up about a ruling on Doctor Who DVDs, after all? Especially when we already know that good parents will already carefully police what their children see and bad parents won't care, provided the kids aren't screaming. But it's because some of us want to live in a country governed by a proper sense of proportion that we do react to every incursion of political correctness. We don't want a society where access to entertainment and the upbringing of children are subject to a thousand tiny, well-intentioned but ultimately infantilising interventions. There are a host of traps and temptations for our children to which sensitive parents need to be alert, such as the way teenage magazines push forward sexual boundaries. But the answer to this, and many other dangers, lies in teaching children to take responsibility for themselves and resist the fashionable flow. The best children's authors realise that, and embody it in their heroes, from Charlie Bucket to Harry Potter. It's a pity that wisdom is, in every sense, so alien to the Censors. APA 6th ed. : Gove, Michael (2005-05-17). The censors ... will ... exterminate. The Times p. 18. MLA 7th ed. : Gove, Michael. "The censors ... will ... exterminate." The Times [add city] 2005-05-17, 18. Print. Turabian: Gove, Michael. 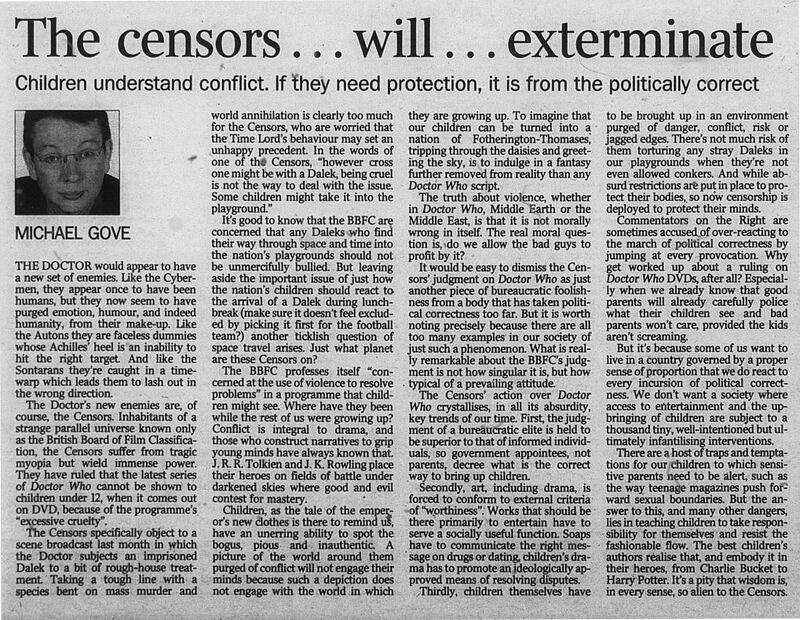 "The censors ... will ... exterminate." The Times, 2005-05-17, section, 18 edition. This page was last modified on 26 April 2014, at 18:41.